Adam's parents have been eating plant-based and experimenting with different vegan recipes. Recently his mom made a pasta dish with tomato sauce packed with veggies that was delicious, so I decided to create my own spin on it! I like to cook my veggies lightly so that they still have a slightly crunchy texture to them and so that the nutrients will be better preserved. I also like to cook the beefless crumbles separately so I can control how much of them are in each serving, as I like to have way more veggies than anything else! This recipe makes enough for at least six large servings, so it is perfect for meal prep. 1. Heat 1 Tbsp coconut oil and 1 Tbsp minced garlic in a large skillet over medium-high heat until fragrant. Add onions and cook until translucent. Add bell peppers and cook until they reach the texture you enjoy. I like them slightly crisp still, so I cooked them or about 7-10 minutes. Remove from heat and put cooked veggies into a separate bowl. 2. Heat 1 Tbsp coconut oil and 1 Tbsp minced garlic in that same skillet and over medium-high heat until fragrant. Add mushrooms and cook covered for 7-10 minutes, until tender. I added salt and pepper to them while cooking. Remove from heat. 4. Cook Beyond Meat according to stove-top directions on package, in a medium skillet. Remove from heat. 5. Cook pasta according to directions on package. Drain. 6. Add veggie mixture and mushrooms to simmering sauce and allow to heat throughout if the veggies got cold. 7. 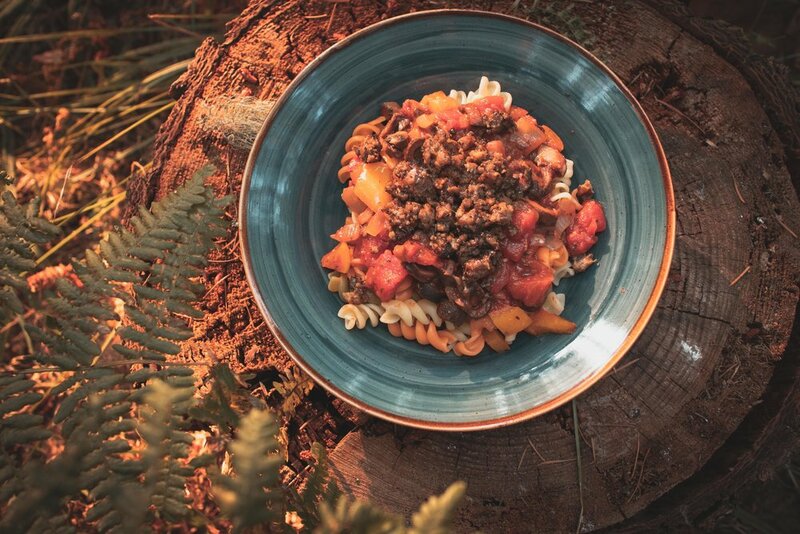 Serve pasta with a generous portion of veggie sauce + Beyond Beef crumbles on top. I added some nutritional yeast on top for a cheesy taste and extra B12. Eat immediately or store in the fridge for use throughout the week!